Baked beans are a delicious way to “fill in” a quick and easy meal. I do have a great recipe for my slow cooker to make beans from scratch (I’ll post it another time) but, while easy to do, you need to have thought of making them the day before!! 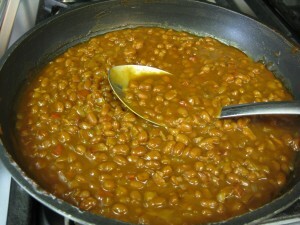 Canned beans can easily be doctored to taste more like the homemade kind and can be ready to eat in the time it takes to bake a potato, grill a steak, and put some corn on the cob to boil. 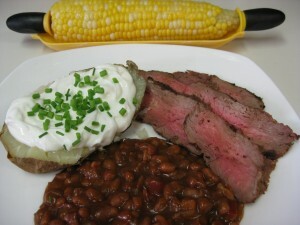 If you have someone else to grill the steak and husk the corn, it’s even easier!! Beans simmering down to great taste!! In the hot summer days, I don’t like putting the oven on any more than I have to preferring to use the barbecue as much as possible. For quick and easy baked potatoes, scrub and prick them with a fork, then microwave until not quite ready but starting to soften – about 5 minutes for 1 large potato adding another minutes or so for each additional potato. It does take a bit longer the more potatoes you put in the microwave. Then place the potatoes on the small upper shelf of the barbecue or along one edge of the barbecue while you preheat it for the steaks. These potatoes will taste much better than ones completely done in the microwave. Serve with sour cream (as low fat as you like), chives and grated Parmesan cheese – even bacon bits if you like. Our favourite weeknight, everyday steak is a top sirloin. They frequently come on sale around here. Some seem to be more tender than others but generally have great flavour especially when cooked medium rare and then sliced to serve. Slicing the meat makes it go further – you eat a lot less red meat – and I like the look of it on the plate. While there are recipes for wonderful rubs and marinades for steak, for a quick, last minute meal we just rub a bit of oil on each side of the steaks, sprinkle generously with steak spice – your favourite – then grill to medium rare – about 4 – 5 minutes on each side over a hot grill – then let rest for at least 5 minutes. With experience, you will get better and better at getting the right degree of doneness. The time will depend on the thickness of the steak, whether or not it’s at room temperature (it should be if possible) and the temperature of your barbecue. This meal came together as a quick and easy one but it would be a great easy meal for entertaining too! In large frying pan (helps the beans cook more quickly), sauté the bacon and onion (and fresh red pepper if using) over medium to medium-high heat until onion is translucent and softened. Stir in red pepper and sauté a minute or two more. Stir in remaining ingredients except molasses. Simmer a few minutes. Taste and see if you think you want the molasses in there or not. Substitute brown sugar or maple syrup for a less intense flavour. Continue to simmer about 5 minutes. If you need to hold them longer, you may need to add a small about of water to maintain the consistency. More of a method than a recipe, these onions are a snap to make. If you like onions, you will LOVE this! I made them to go on our hamburgers but they would also be great with any other grilled meats or tossed into a pasta salad. 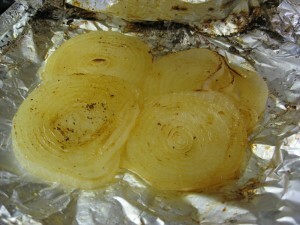 The basic yellow cooking onion is what I use for this recipe but white or red would be fine as well. Be sure you are buying the seasoning salt without MSG. Regular salt could be used if you prefer but the flavour won’t be quite the same. I love this with butter but oil would work well too. I have even made this with one of those soft healthier margarines – a friend I was cooking for preferred this margarine – and the results were good. Make sure to seal the foil well, folding in the three sides at least twice and pressing the foil to seal. When opening, be very careful of steam. You could just cut a large X in the top and pull back the foil to serve. It just occurred to me as I was working on this post that a splash of balsamic would be good as would a sprinkling of herbs. The possibilities are endless. I’ll let you know when I try some different combinations!! 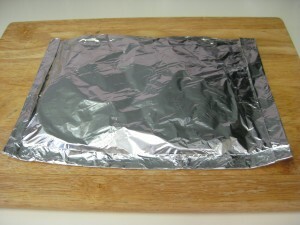 Tear a sheet of foil large enough to hold the slices in a single, slightly overlapping layer on one half of the foil leaving a couple of inches around the edges for sealing the foil. 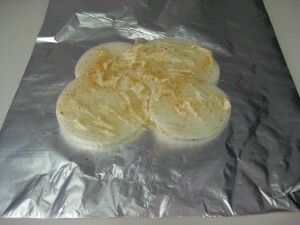 Spread with butter (as much or as little as you like) or drizzle with oil and sprinkle with seasoning salt and pepper. Fold foil in half and seal the three open edges being sure there are no places that could leak. Place on barbecue over medium hot heat for about 15 – 20 minutes or until done to your liking. I have made these very yummy new potatoes for years. Everyone seems to love them. Sometimes it is a hunt for those tiny new potatoes but it is worth it. If you can’t find the really small ones (about 1 inch or less across) you can cut slightly larger ones in half as I did for the ones in the picture. The recipe works well with anyone of the smaller potatoes found on the market especially the fingerling potatoes we can find at the public markets. It calls for a LOT of butter. I have used part butter and part oil or even totally replaced the butter with oil and had great results. I use dried basil because, much as I love fresh basil – sometimes I keep a bouquet of it around my kitchen just for the look and smell of it – it doesn’t stand up to the heat of the barbecue. You could sprinkle some fresh basil over the potatoes after they are done. Chives add a very distinct flavour if you have them – they are easily grown in your garden or in a pot. The original recipe from Canadian Living was for individual servings folded into foil packets – a cute idea but rather labor intensive. I’m also leary of foil packets on the barbecue as they easily leak and cause those nasty flare-ups. Try serving these as an appetizer with toothpicks and sour cream as a dip!! The picture shows the potatoes done uncovered and about half done. Unfortunately, in the rush of getting everything on the table for a family dinner, I forgot to take a picture of the finished product! Just have to make them again soon!!!!!! For barbecue, you will need a deep 9 X 13 foil pan. Can be baked in oven in 9 X 13 baking dish. In small microwaveable bowl, mix butter, garlic, basil, chives, and salt. Add fresh pepper to taste. Place clean baby new potatoes in pan. Pour butter mixture over and toss to coat potatoes. Seal with foil. Place on medium high barbecue or in 400 F oven and bake about 30 – 40 minutes or until done. Shake pan occasionally. The time will depend on the temperature of your barbecue and the size of the potatoes. NOTE: These potatoes can be done UNCOVERED and come out more like roasted potatoes. Try both ways and see which you like better! Homemade french fries are a treat worth the effort to make. Using a healthy oil such as canola and the correct frying techniques so that the chips do not absorb too much oil makes them better than any fast food fries!! 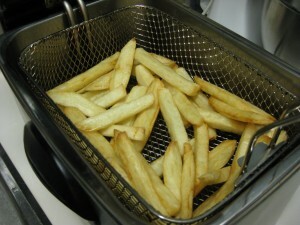 I strongly prefer to use a deep fryer for safety reasons – they are more stable and much less likely to be tipped (make sure the cord is completely tucked away) and you can control the temperature greatly reducing, if not eliminating, the possibility of the oil getting too hot and catching fire. You should NEVER let the oil get smoking hot as that is the last step before it catches fire!! Never try to move any appliance or pot containing hot oil – let it cool completely – the possibility of injury is way too high. The newest fryers even strain and store the oil for you!! Definitely worth the extra money! The key to a crispy french fry is the type of potato you use. Russets produce the best result. Even baking potatoes may not be a russet and will not crisp up well. Some potatoes will not work no matter what you do!! Many sources tell you to fry the potatoes twice. I actually fry the potatoes 3 times for the best result. Interestingly, I have discovered that leftover fries which I have frozen are nice and crispy when re-fried in the deep fryer. This may explain the crispy fries restaurants are able to achieve. There are lots of instructions for achieving wonderful crispy fries out there. Here are my steps for making crispy homemade french fries. 1. Peel the russet potatoes and cut the french fries. I most often cut them by hand but there are great cutters available which will do it for you. Make sure to get one that takes a larger potato. Some offer you thick and thin cuts. Soak in cold water until ready to fry. 2. Preheat the deep fryer to 375 F.
3. Take enough potatoes to fill the basket no more than ½ full and pat them dry with a dish towel. Lift the basket from the oil and place the potatoes in. Lower carefully into the oil and immediately reduce the heat to 325 F. Fry for 2 to 3 minutes until just starting to colour. Lift the basket and drain the oil. 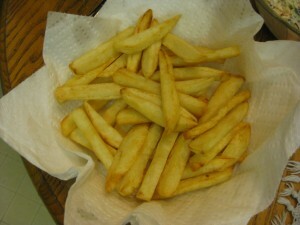 Turn fries onto a plate (I use a glass pie plate) lined with paper towel to drain. Repeat until you have done all the potatoes. 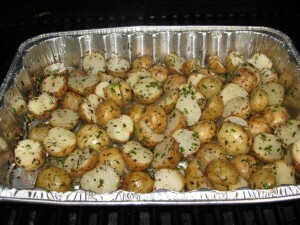 The potatoes should cool for a few minutes before proceeding to step 4. 4. Starting with the first batch, re-fry the potatoes for another 2 to 3 minutes until staring to brown. Drain and replace on paper towels. Repeat for all potatoes. This step can be done well ahead of the meal – it is fine to let them cool. 5. Turn deep fryer up to 375 F. Re-fry each batch of potatoes until done to your liking – usually another 3 – 4 minutes depending on cool the potatoes are. The potatoes start to rise to the surface when getting done. 6. Serve immediately sprinkled with salt, if desired. Beautiful to look at and delicious too!! After a weekend of rather decadent eating I felt like something light, fresh and healthy for dinner. A stir-fry was just the thing. Stir-fries are generally considered a quick and easy meal BUT the prep work of cleaning, maybe peeling, and cutting all the vegetables up can be time consuming. Limiting the selection to about 3 vegetables obviously saves time. One way to speed up the actual meal is to prepare the vegetables ahead of time – morning or the night before – and store in the fridge. Another way is to choose meat and vegetables which require less prep. Lean meat such as steak, pork tenderloin and boneless chicken can be quickly cut into bite size pieces. Some stores offer meat already prepared to go into a stir-fry – with or without a marinade. Veggies like snow peas and baby carrots can be used with no prep time – or you can buy them ready to go, eg. sliced mushrooms, and others like broccoli crowns and red peppers can be quickly cut with no peeling required. To chop a sweet pepper quickly, simply slice the sides off leaving the seeds and core in the middle to be easily disposed of. I prefer to cut onions lengthwise (from root to stem) for a stir-fry creating wedges. To peel an onion quickly – cut off the root end then cut in half. The peel comes off each half very easily. Some vegetables like broccoli and carrots take longer to cook. I prefer to blanch or steam these separately until barely tender crisp – the microwave makes quick work of this – then stir them in with the meat. Especially broccoli can be too hard or get “chewy” in a wok. If you have older children, get them involved. If everyone prepares one item you will be done in no time. 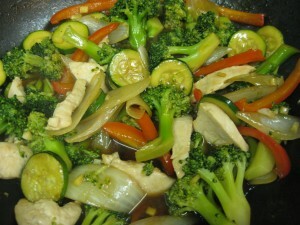 The stir-fry in the picture was made with boneless chicken breast, onions, broccoli, red peppers, and zucchini. This may be the only recipe you will ever need for a delicious stir-fry dinner. By changing the liquid and adding different meat, vegetables, flavourings and seasonings you will have many different options. Just be sure to write down combinations your family especially likes – if it’s really good you will want to be able to make it again. Stir all sauce ingredients together and let stand while preparing stir-fry. You can taste this sauce and it will give you a good idea of how it will taste in the stir-fry. Adjust to taste. Sesame oil should be added at the end to preserve it’s flavour. For easy slicing, firm meat slightly by placing it in the freezer for about 30 minutes or use partially defrosted meat. With a sharp knife, thinly slice meat into 1/4 inch wide strips. Then cut meat into bite size pieces. Pat meat dry with paper towels. Sprinkle meat with a little soy sauce to add more flavour, if you wish. 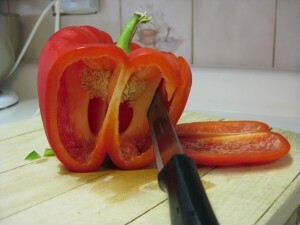 Prepare vegetables by cutting in bite size pieces – not too small. Some vegetables, like broccoli, I prefer to blanch or steam separately then add to the stir-fry with the meat. 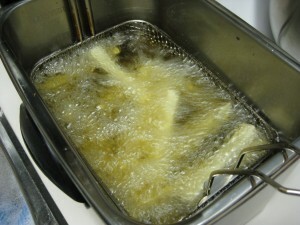 Heat oil in a large wok or deep frying pan set over medium-high heat. Stir-fry meat quickly until lightly browned and just cooked through – about 3 minutes. Remove from wok to a plate. Add a bit more oil if necessary and stir-fry vegetables adding the vegetables which take longer to cook first then adding the remaining. Cover pan between stirring to steam (you may need to add a tablespoon or so of water to create steam) vegetables that need more cooking. You will get better at this with experience. 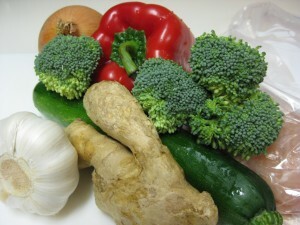 Many of the vegetables do not need much cooking and will taste great as long as they are hot. Do not overcook. Stir in sauce and browned meat. Cook until comes to a boil and thickens. If you would prefer a thicker sauce, stir more cornstarch into a little stock and slowly add to the stir-fry. Do not overthicken. Serve over rice or Oriental style noodles. Sprinkle with toasted sesame seeds. Over the years people have told me I should write a cookbook. Well - this is it. If I had written a cookbook, my first book would have been recipes to help people put dinner on the table. You really can't get real home cooking in a restaurant. It is not as hard as it may seem. I hope to write the recipes in easy to follow and clearly described steps - if you can read, you can cook. Where applicable, I will give "shortcuts" you can use to achieve the same recipe.